I just wish to highlight this very horrible thing that children between the ages of 6-12 do near my house almost every day. There is a small tree just opposite my house ... a few meters away to be precise, and it is frequented by many small birds (mostly warblers) throughout the day. These boys, for want of nothing better to do, indulge in a vicious sport where they try and bring down these birds by hurling stones at them with slingshots. Their aim is fairly accurate, as they manage to stun and capture many warblers, and also kill many of them "incidentally". When asked why they do this, they usually smile at me and say that they will take these birds home for "mom to cook". Has anyone ever heard of warblers being cooked for their meat? I mean they hardly weigh 80-100 grams each, all told, and if they are skinned and then cleaned, what amount of meat are you going to obtain from each of them? Hence, to me at least, it looks like a blatant lie. Here is a picture of their "booty" on a fine Friday morning. 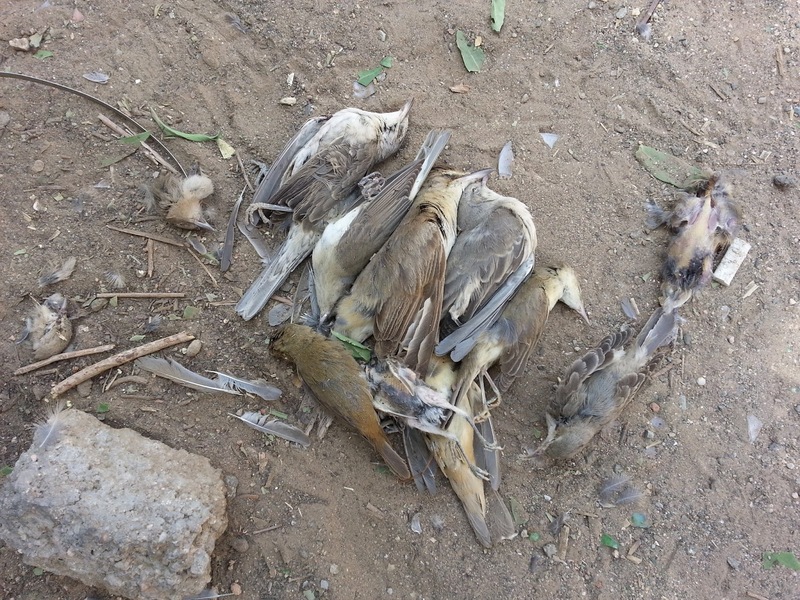 Two decapitated heads lie just outside the bunch of these dead warblers. The parents of these children probably know about this activity - how couldn't they? However, there seems to be an attitude of ignoring this mass murder of birds. P.S. The boys let me take this picture; they were not at all perturbed by what they were doing and did not know why I should be taking the picture. You are wrong about their motive, as small birds are also in restaurants around the Middle East. Perhaps you can also lack the benefit of the doubt for posting this with nothing but inflammatory purposes.